Spring marathons are on the horizon and fast approaching. In the UK some of the bigger ones include London, Brighton and Manchester whilst further afield you have the likes of Boston and Paris. Hundreds of thousands of runners will take on the magical 26.2 mile distance, aiming for completion or to beat PB’s. Tom completed his first marathon in 2013 and has since run over 17 marathons and ultra marathons in various locations around the world. Whilst the UK is currently experiencing its coldest winter since 1991 with the “Beast from the East”, here’s Tom’s Top 10 Spring Marathon tips to help set you up for the big day. Whether you’re a seasoned marathon runner or giving the 26.2 miles a try for the first time hopefully there’s something to help with your marathon journey. Try following a training programme. I used to run a lot of half marathons and never followed a programme. It was essential to use one during Marathon training in order to get enough miles into my legs and I used one of the Runner’s World Garmin schedules. I’ve also found that using a programme to add structure to my training with speed sessions, tempo sessions and long runs really helped to keep my motivation up. Enter races as part of your training. From 10k’s for tempo and speed work to half marathons and longer 20 mile races, these are a great chance to push yourself in an environment surrounded by others. 20 mile races can give you a big confidence boost as you head towards race day and are a good chance to get in a long training run without having to do it on your own. The long runs do become easier. I remember back to my first 18 mile training run and it was hard work, really hard work. I was running low on energy towards the end and felt like I was dragging myself back to the front door. My legs ached, I was exhausted but loved the accomplishment of having done a “long run”. As I increased the distance it became easier and that’s because you’re training and that’s exactly what they are; training runs. If you’ve never taken energy gels or nutrition before, try taking on different gels or supplements during training, although try not to take them too regularly or you’ll potentially start to rely on them for training alone. Different marathons work with different sponsors and they may provide energy gels at water stations, such brands may include Science In Sport (SIS), Torq or High Five. Try out these brands in advance, sometimes gels don’t sit well with people, so it’s worth finding out in advance if you have any adverse reaction to them. Remember to stay hydrated on race day. You’ll often have information in advance of how frequently the water stops will be. They might sometimes be on one side of the road only, so take notice of any signs and ensure that you’re careful not to trip over any other runners or bottles! I’ve missed water stops previously but in hindsight it may have been better to lose time getting water rather than lose time towards the end of the race when I was tired and dehydrated. Give your kit a test before race day, try out what you’re going to wear and ensure that you’ve done some miles in your trainers. There’s nothing worse than putting on a new pair and getting a blister mid-marathon! If you’re aiming to pace your race mile-by-mile or km-by-km try not to rely too heavily on a GPS watch. When I’ve run marathons in Paris and London I’ve ended up losing signal in underpasses and this can send your splits off. You’ll also generally run over the marathon distance, clocking anywhere from 26.2 – 26.7 miles (unless you ran Manchester in 2014 like me! ), so ensure that any consistent pacing covers this difference. On the day of your race take a look at the course and plan in advance where to see relatives/spectators that are there to support you. This way you’ll know exactly where they’ll be on the course and hearing them cheering and seeing familiar faces is a massive boost when you’re starting to feel tired. Enjoy it! There will be ups and downs, it might not go to your exact plan, but enjoy every minute of it. Running a marathon isn’t easy no matter how many you’ve done. Soak up the atmosphere – get your name printed in large letters on your vest/top so that people can cheer for you individually – you’ll be surprised at how many do! During those tough times think about all of the training that you’ve done and how proud you’ll feel at the finish line, it’s such an accomplishment! Try not to say “never again” – I said that after my first marathon, but you might be just like me and soon change your mind! Good luck with your training and remember to listen to your body! 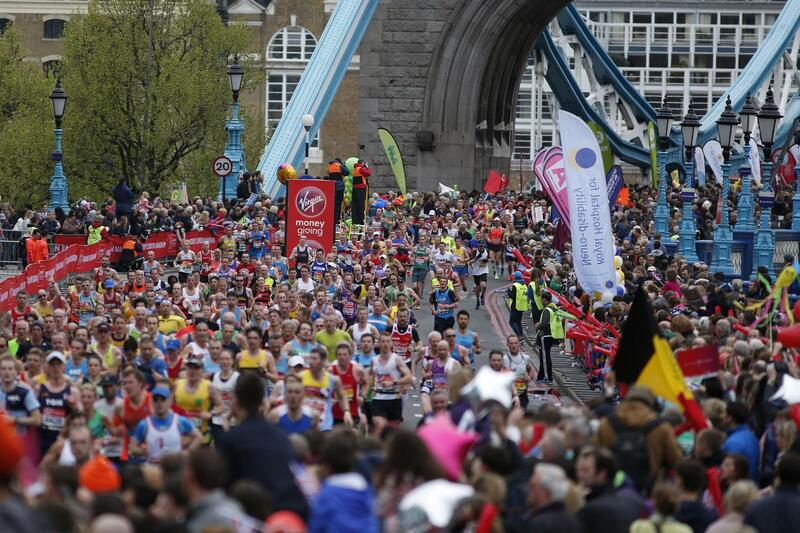 Let us know how you get on in your Spring marathons. If you’re looking for the perfect gift for a marathon runner, check out our unique, hand designed 26.2 mug, perfect for celebrating or warming you up whilst the UK winter lingers into March!